Last week at the Anaheim Convention Center, where 18,000 fans descended upon VidCon to glimpse their favorite YouTube stars, Jumbotrons and ballroom walls were bathed in bright red branding for YouTube -- the six-year-old conference’s title sponsor. Onstage, however, industry leaders projected a vastly different picture of the humming video landscape. The most sweeping trend to emerge from the three-day conference was the explosion of rival platforms -- all vying for a slice of digital video advertising’s $13.8 billion pie. Three names that seemed to be on everyone’s lips? Facebook, Snapchat and Vessel. “Most social platforms tend to move into video -- that’s where more dollars are,” said George Strompolos, founder of the leading multi-channel network (MCN) Fullscreen. But as the only service approaching 2 billion users, he called Facebook’s foray the most promising by far. 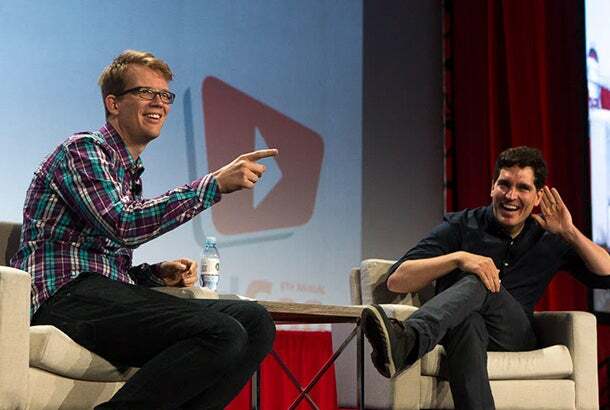 VidCon founder Hank Green with Vessel's Jason Kilar. Snapchat, on the other hand, has enthralled younger users -- 63 percent of whose 100 million daily users are between the ages of 13 and 24. “We can have a one-on-one communication, or it can feel like social media, or it can feel like really premium content,” Fitzpatrick said. While neither Facebook nor Snapchat exhibited at VidCon, Vessel was a major sponsor this year, and CEO Jason Kilar presented on the four-month-old company’s rise. The service continues to woo top-tier creators, Kilar said, because it offers a cut of both advertising and subscription revenues -- translating to a $50 CPM, or rate of payment per 1,000 views, which is 20 times larger than average rates currently offered by YouTube. A proliferation of social platforms wasn’t the only faction capitalizing on VidCon’s swelling powers. What began as a grassroots gathering of 1,400 fans at a Los Angeles Hyatt hotel has now turned into a veritable showcase for some of the world’s biggest brands. Looking around the show floor at first-time exhibitors CoverGirl, Jimmy Kimmel Live, Panasonic and People -- who paid as much as $70,000 for their booth setups -- is an irrefutable validation of the digital space, notes Meghan Camarena, a YouTube star who attended the very first VidCon back in 2010. This, in turn, has elevated the event in the eyes of attendees. 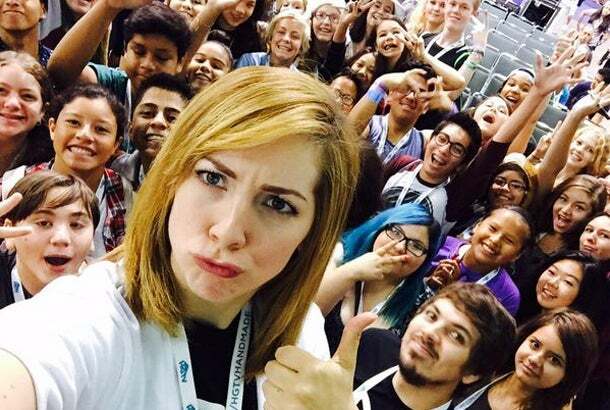 While VidCon is still typified by mob-like worship in the form of selfies and sobbing, “this year the fans seem to have a little bit more respect,” Camarena said. At the end of the day, however, as competing platforms continue to flood the space, and as brands increasingly shift television ad dollars into digital, only one clear victor in the battle for online video has emerged: creators.